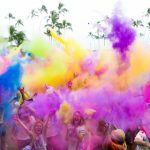 The 27th Annual East Maui Taro Festival will be held on April 13 and 14, 2019 in Hāna at the Hāna Ballpark from 9 a.m. to 5 p.m. Admission is free. 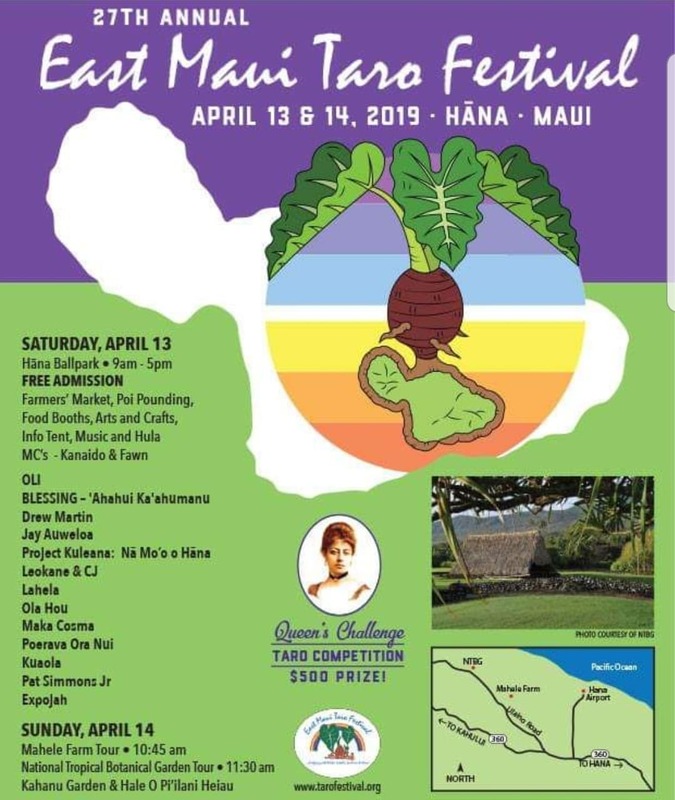 The 27th Annual East Maui Taro Festival will be held on April 13 and 14, 2019 in Hāna, Maui at the Hāna Ballpark from 9 a.m. to 5 p.m. PC: EMTF. 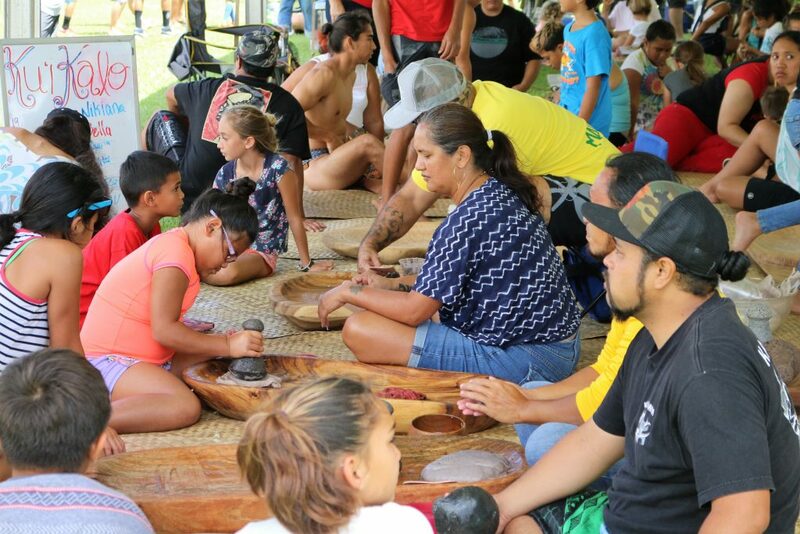 The event features a farmer’s market, kalo pounding demonstrations, food booths, arts and crafts, an information tent, music and hula, and live MC’s. A Queen’s Challenge taro growing competition with $500 prizes in both wetland and dryland categories will also be available for Maui taro farmers. 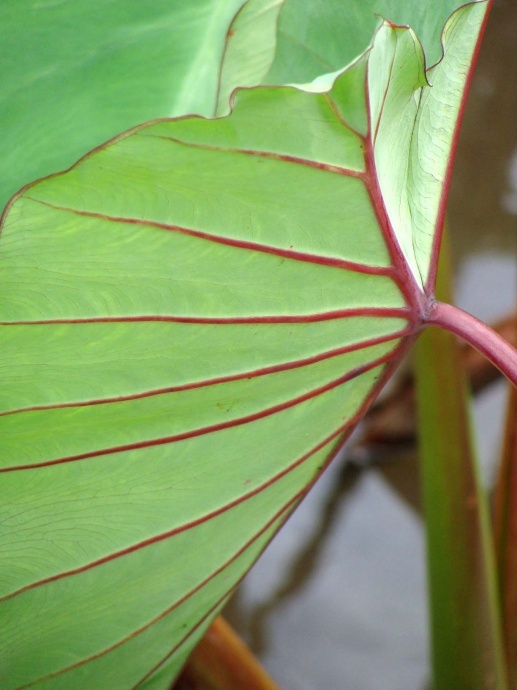 Entries must be Hawaiian varieties found in Bulletin 84: Taro Varieties in Hawaii (1939); a two-point advantage will go to taro grown organically in honor of Queen Emma’s proficiency in growing kalo and caring for the soil. Maui Lehua, other hybrids and non-Hawaiian varieties will not qualify for this competition. 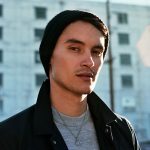 On Sunday, April 14, Mahele Farm Manager Mikala and Kahanu Garden Director Mike will lead tours on natural regenerative agriculture practices, information about Piʻilani Hale Heiau, and the plants of the Pacific including the world’s largest breadfruit collection. 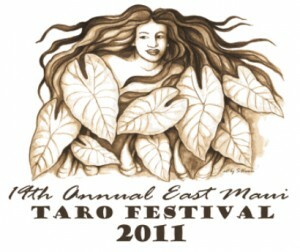 Tours at Mahele Farm will begin at 10:45 a.m. Tours at Kahanu Garden will begin at 11:30 a.m.
For more information about this event or to register for the Queen’s Challenge, visit tarofestival.org.